Maybe others can decode this bit of Treasury Department propaganda better than I, but it seems, contra its own billing, to show that the first three years of George W. Bush's were really, really bad, not that his fourth year was really good. After all, the 2003 tax cut the graph trumpets appears to heal the economy in under a month, but Bush was elected three years earlier -- so what was he doing during the interim? Playing Boggle? The graph is so ugly I put it below the fold. Anyway, it got me to thinking about a famous point that Orwell made, that one reason that propaganda is often poorly written is that the propagandist wants to give a particular impression while being vague on the details. It is true, of course, that presidents have less direct influence over the economy than the public believes, so don't be misled by my labeling, which is intended as a rejoinder to the Treasury graph. On the other hand, however, Princeton's Larry Bartels has demonstrated that Democratic presidents have consistently produced greater GDP growth, lower unemployment, and lower inequality than Republican presidents (without producing much more inflation) since World War II. This finding suggests that pundits like Matthew Yglesias shouldn't be so quick to shift blame away from President Bush for the lackluster labor market, which Kevin Drum also attributes to Republican labor market policies. 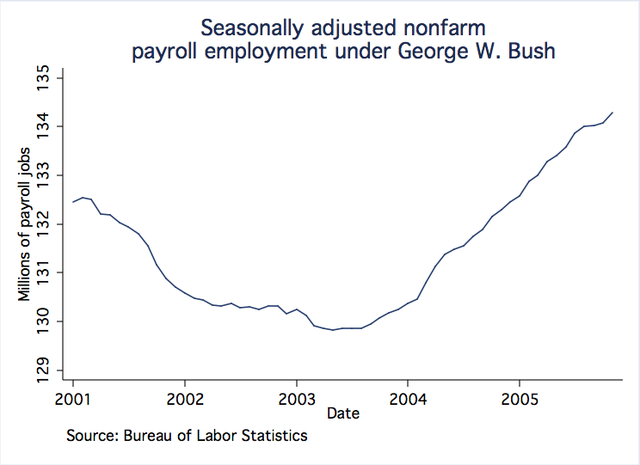 Contrary to Treasury's propaganda, the labor market has been relatively slack under President Bush, and his failure to deliver across-the-board employment and income gains appears to be part of a long-term historical pattern. President Bush's first fiscal year was FY 2002 (which began Oct. 1, 2001). FY 2001 was the final Clinton budget year. 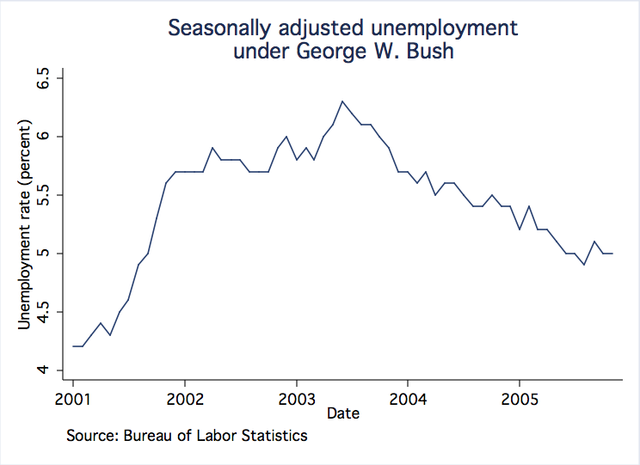 You are blaming Bush for the sharp decline in employment and increase in unemployment which occurred BEFORE the START of his first budget year! The sharpest part of that economic decline occurred during the last Clinton budget year. Blaming Bush for it makes about as much sense as blaming him for the dot com bust of 2000. 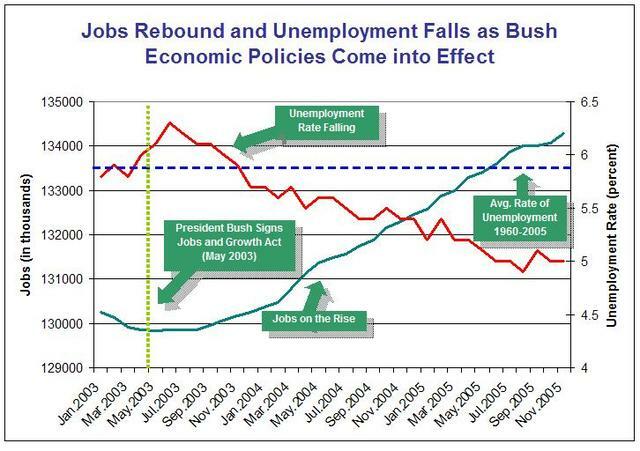 Bush inherited the recession. By the end of 2001 (only three months into the first Bush budget year), the 2001 recession was technically over, and by mid-2003 unemployment, which is always a lagging economic indicator, was falling. The ship of state does not turn on a dime, and, frankly, the Clinton and Bush economic policies were not dramatically different (in part because of Republicans in Congress). So blaming them for bad economic news and crediting them with good economic news is a questionable practice. But it certainly isn't as rediculous as blaming President Bush for the 2001 recession which began BEFORE his first budget year. It's hardly an unbiased observer that would use the word "slack" to describe the current rate, which your own chart shows only 3 years of the last 25 are better. If you'd showed Carter and the years before, it'd probably be only 3 years out of the last 50 were better. Being 3rd out of 50 puts you in the top 10%. I realize the whole anectdote/data discrepancy, but many people I know experienced some long-term unemployment in 2001-2004 -- averaging around 14 months. All college educated, experienced workers with good track records. This coincided with national news stories about how many unemployed people were no longer counted because they had run out of unemployment funds and/or had temporarily given up on finding a real job. I wonder if this was some sort of a sector/industry fluke or regional or if it really was such a low confidence level in the economy, those people without jobs were not counted because they'd given up. 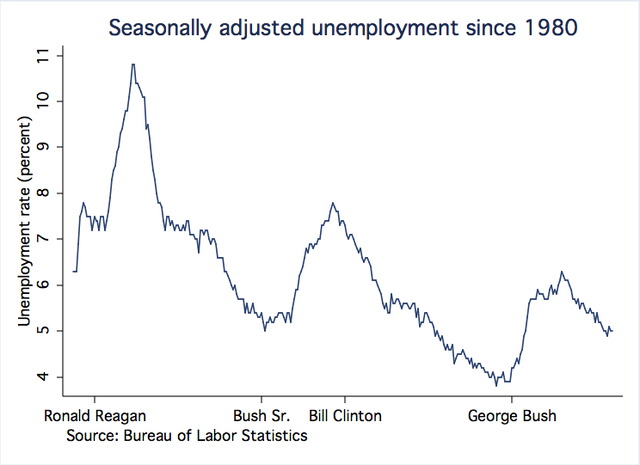 It is hardly a Clinton recession when it began three months after Bush took office. Ditto for the Reagan recession. Perhaps these conservatives can explain why every study shows GOP control of the White House or Congress is terrible for the economy - even if you lag the effects one or two years. The reason is the GOP harms the mass of the American people who need the money to buy things while showering the benefits to the few.